Can Your Dandruff Cause Hair Loss? 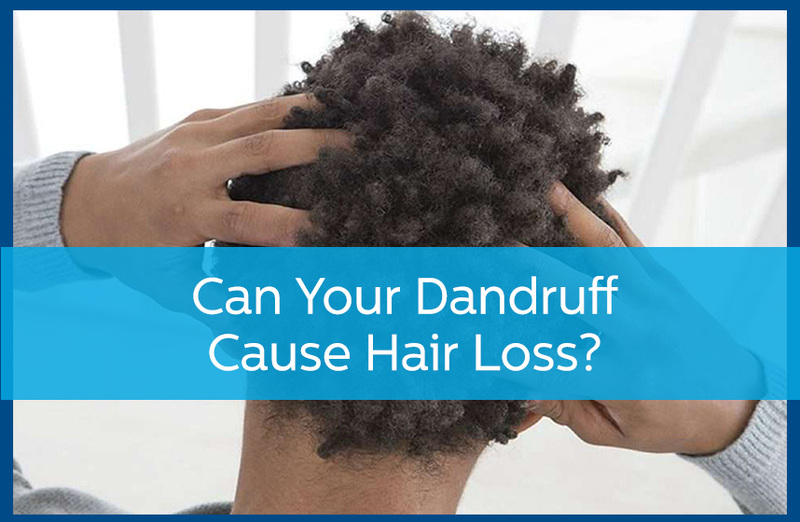 The answer is “mostly, no.” Dandruff and hair loss are related, but it is not a directly causal relationship. Men, in particular, frequently have both hair loss and dandruff. It is quite common to have both. So how are the two conditions related? Neither condition causes the other, and each usually has its own unrelated causes. Dandruff is a skin condition. Excessive hair loss is caused by problems with the hair follicle, not the skin. While some of us lose more hair than others, some hair loss is normal and experienced by everyone. While these two conditions are not directly related, it is easy to think they are. After all, when every time we use a dandruff shampoo, we see hair coming out, it is an easy mistake to make. Most of the time, we don’t really see our hair loss except when we shower or shampoo. The fact that they are seen together has made some men cut back or even stop shampooing, but that is not wise. Neither the dandruff nor the shampoo is causing your hair to fall out. In fact, washing your hair with any shampoo makes practically no difference in how much hair you lose. If you stop shampooing regularly to limit hair loss, you will just see more hair loss when you finally do shampoo again. One other factor needs to be mentioned here. If you cut back on dandruff treatments, the worsening dandruff will cause more itching and scratching. The scratching may, indeed, pull out some hair that would not have come out otherwise. So, your dandruff won’t cause hair loss, but it could cause the itching that resulted in you inadvertently pulling out your own hair. Finally, in particularly severe cases of dandruff, typically caused by conditions such as seborrheic dermatitis or psoriasis, there can indeed be hair loss directly triggered by the “dandruff.” The marked inflammation that accompanies these particularly severe cases may indeed at least temporarily interfere with hair follicle function and lead to increased hair loss. This is a case where treatment by a dermatologist is particularly important. What about hair loss medications? They can be a factor, since some of these medications contain alcohol. Alcohol dries out the skin, which could result in flaking. If this happens, you can always switch to a medication that does not contain alcohol, or just use a dandruff shampoo. Untreated dandruff can become very itchy and even inflamed. This can result in some hair loss that you would not normally be experiencing. This is usually a temporary hair loss that would grow back after you alleviate the dandruff. If your dandruff gets unusually bad, there are steroid creams that can also be prescribed. If you have both conditions, the best course is to use a hair loss medication and keep using your dandruff shampoo. If you have any questions, contact the experts at Avail Dermatology by calling 770-251-5111 and get effective treatment for your hair loss and dandruff problems. https://availdermatology.com/wp-content/uploads/2016/11/DandruffHairLoss.jpg 560 858 John Lenz /wp-content/uploads/2017/08/logo.png John Lenz2016-11-01 15:41:532018-08-06 19:27:16Can Your Dandruff Cause Hair Loss? Understanding Hair Loss Causes and Treatment Options Plantar Warts: What are They and How are They Treated?